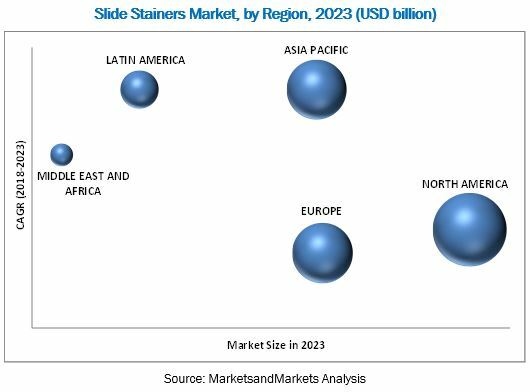 [140 Pages Report] The slide stainers market was valued at USD 2.52 billion in 2017 and is expected to reach USD 4.70 billion in 2023, at a CAGR of 11.0% during the forecast period. The base year considered for the study is 2017 and the forecast period includes 2018 to 2023. The global slide stainers market is projected to reach USD 4.70 billion by 2023 from USD 2.79 billion in 2018, at a CAGR of 11.0%. Factors contributing to the growth of this market include the increasing incidence of chronic diseases, increasing automation in laboratories, rising geriatric population, and increasing healthcare expenditure. The report analyzes the global slide stainers market by product, technology, end user, and region. On the basis of product, the reagents segment is expected to grow at the highest CAGR during the forecast period. This can be attributed to the rising prevalence of chronic and infectious diseases, increasing healthcare expenditure, increasing public awareness, and growing demand for automation in diagnostics and clinical research. Based on technology, the hematoxylin & eosin (H&E) segment accounted for the largest share of the global slide stainers market in 2017. The large share of this segment can be attributed to the fact that H&E staining is the initial staining technique for various diseases and is associated with better quality, ease of use, and higher throughput than most other staining technologies. Based on end user, the hospitals and diagnostic centers segment is expected to register the highest CAGR during the forecast period. The growing prevalence of diseases and huge patient inflow in hospitals and diagnostic centers are some of the factors that are likely to boost the growth of this market during the forecast period. Geographically, the global slide stainers market is segmented into North America, Europe, Asia Pacific, Latin America, and the Middle East & Africa. In 2017, North America accounted for the largest share of the slide stainers market, followed by Europe and Asia Pacific. Factors such as the highly developed healthcare system in this region, the easy accessibility to technologically advanced instruments, and the presence of major key players in the region are responsible for the large share of the North American slide stainers market. The implementation of excise duty by the US government is expected to limit the market growth during the forecast period. In addition, dearth of skilled technicians and product recalls are some of the factors expected to restrain market growth during the forecast period. 11.10 General Data Company Inc.